RFK Stadium, exists primarily in my memory. I say primarily, because it actually still physically exists. At 2400 East Capitol Street SE, RFK Stadium still sits. You can take the Orange Line, past the Stadium-Armory station, and see it’s curved top layer and metal facade, perched on a cracked, over grown parking lot. From what I’ve read and heard, calling RFK a shell of its former self would be kind. Years of neglect have resulted in decaying infrastructure and a home team that consists of families of rats. DC United is still a permanent tenant, that is until they move onto their long awaited new digs around the corner from Nationals Park in SW DC. I’ve only set foot inside RFK once, and it was 18 years ago. It still stands as my favorite memory spent at a game, and one of the best days of my life. This is the first FSB Stadium Review, which will typically consist of first hand notes that I can pass along regarding location, concessions and the overall fan experience. But to kick things off, I had to go RFK. This review will be a little different because there’s really no reason locate RFK these days (Taking the Orange Line is your best bet if you really want to go) and you couldn’t pay me to eat whatever they sell at DC United concession stands. The fan experience that I had is definitely worth recalling and sharing. Sadly, that experience doesn’t exist at RFK (or most other stadiums) these days. I’m a 49ers fan. For those reading who weren’t already aware of this fact, you’re probably confused. After waxing poetic about the history soaked, former home of the Redskins, you probably figured I had my Hoggette nose on as I typed. 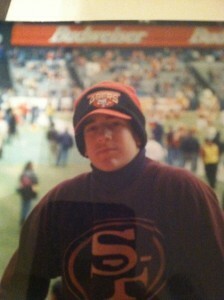 I found a seat on the 49ers bandwagon when I was 8 years old and never gave it up. My allegiance can be dissected in future posts, but for now RFK is the focus. 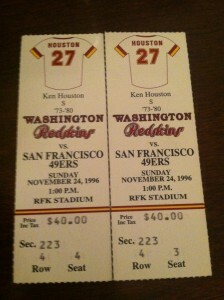 In the summer of 1996, my dad purchased two tickets to the 49ers/Redskins game that would be played that November. On November 23rd, we packed up the car and made the trek from Virginia Beach to DC. The stubs have survived all these years. $40.00 for lower bowl! I was 15 and had never been to an NFL game in person. As we made our way north, my ears were filled with Jimi Hendrix Greatest Hits and old U2 cassettes (thanks yellow Sony Walkman). My head was full of anticipation and hope, a stark contrast from my full time job as a jaded, awkward 15 year old. We arrived at our hotel in Crystal City late Saturday afternoon. My dad and I attempted in vain to find my idol Niners at several of the hotels. All we found were half empty lobby’s and helpful hotel staff, eager to help the excited and awkward teen catch a glimpse of a real live football player. Finally, game day. The good stuff. We took Metro from Crystal City to the stadium and emerged on the other side. A steel grey sky and 40 degree temperatures met us, as we marched up 19th Street SE towards the stadium. The scene was one many current day DC fans are used to, plenty of tickets and knock off hats for sale. My dad got me a Niners sweatshirt (somethings never change, if I see one more Phillies hat for sale outside Nats Park…) and we made our way in with the rest of the 50K+. Stepping inside that stadium and seeing the field for the first time was like stepping inside a TV for me. I’d seen this field a million times on Sunday afternoons, but my senses were on fire seeing it in person. The bite of the cold air, mixed with the smells of cigar smoke and sounds of fan chatter & PA announcers. As far as I was concerned, I was at the Center of the Universe. As we took our seats in section 223, row 4, seats 3 & 4, the nerves of my teenage, sports fan self finally kicked in. 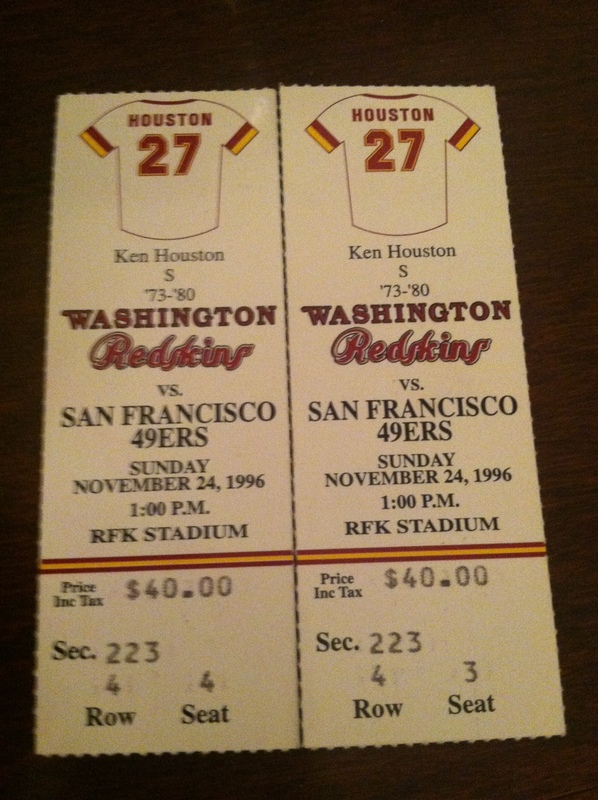 This was a huge game for both teams (both 8-3 entering the day) and the 2nd to last game to be played at RFK Stadium for the Redskins. I noticed something else when I sat down; as I looked diagonally across the field through a small opening on the other side of the stadium, I saw something that there was absolutely no mistaking. The Madden Cruiser. For the uninitiated, The Madden Cruiser is the bus John Madden used to travel to each game he announced because of his fear of flying. When Madden, and colleague Pat Summerall were calling your game, it was serious business. When it came to broadcasters, they were the ultimate A-team. Steve Young himself said there was a different buzz in the building when Madden and Summerall showed up at your game (announcers typically arrive Friday and interview lots of players and coaches over the weekend). Now, here they were, in the same building as me, as we all settled in to watch the same game. 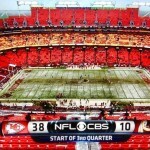 My only thoughts now were, the Niners BETTER pull this one out. The game itself, lived up to the billing. The stadium atmosphere was like nothing else I’ve experienced. RFK is part of the old guard. No frills. No bells and whistles. Just a field, surrounded by metal and concrete, filled with rabid, bourbon fueled fans. The stands? Yes, they literally shook, as famously shown on NFL Films clips from the 80’s. I can still remember the faces of ushers, as my dad bought beers from them in between his photo sessions. 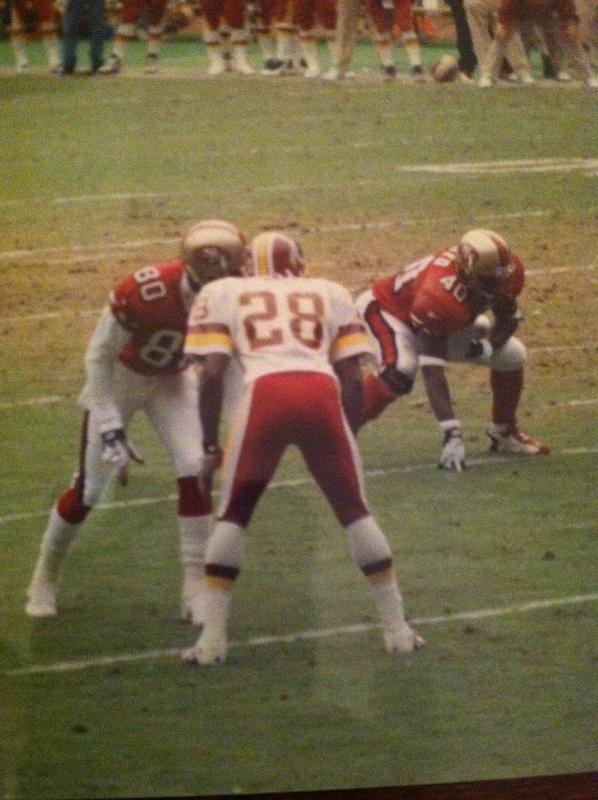 My dad fancied himself a photog, and just last year a picture he took of Jerry Rice and Darrell Green from this game was posted on a 49ers website and was even retweeted by Jerry Rice himself. A close, defensive battle required a 4th quarter William Floyd touchdown to send the game to OT. Of course, after all the anticipation, waiting, hype and pure ecstasy, we got free football. 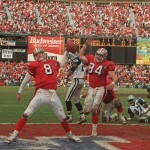 Jeff Wilkins put the game to bed with a 38 yard field in sudden death, and the Niners escaped DC with a 19-16 victory. 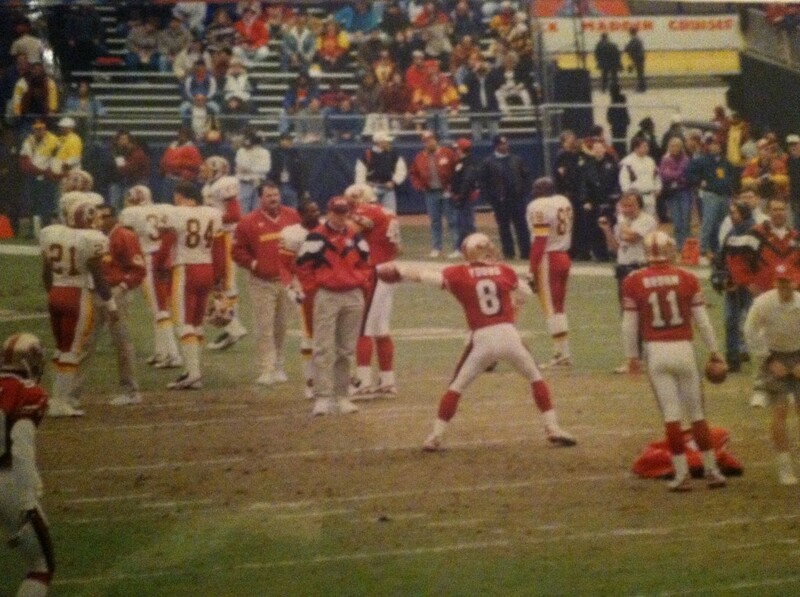 The TV screens in the stadium showed Bill Walsh (now in a controversial and potentially distracting consultant role for the Niners) hugging others shortly after the field goal converted. For those keeping score, I shared RFK this early winter day with Steve Young, Jerry Rice, Darrell Green, John Madden, Pat Summerall and Bill Walsh. William “Bar None” Floyd about to tie things up. As I walked back to the Metro with my dad after the game, somber Skins fans devised plans of how they would get out of family obligations the following Thursday, which was Thanksgiving. The Skins were traveling to Dallas, and so were Madden and Summerall, to call another pivotal, late season game. The Metro was eerily quiet, as I waited for some backlash for my Niners sweatshirt and you-know-what eating smile. We got back to our hotel and made the drive back to Virginia Beach, the temperature dropping and sun long gone. I put in my headphones, turned up the Hendrix and began rehashing the events of a game I’d be writing about 18 years later. 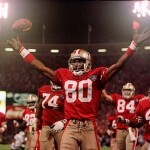 1) Jerry Rice / Darrell Green pic taken by your pops is phenomenal. 2) Cool William Floyd stat: last FB to ever be drafted in the first round! 2) Former Nole. You’re boy. 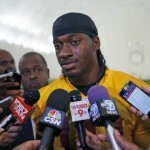 He woulda had a fantastic career if not for a brutal knee injury. Dangerous weapon in the West Coast Offense. A fullback that could catch balls. 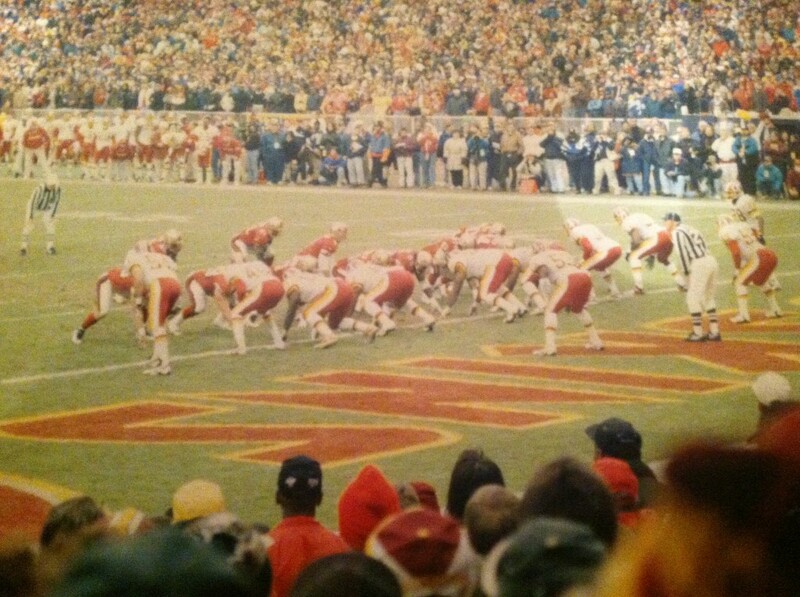 3) Yep…lower bowl, I think like 25 rows back. Felt like you were on top of the field though. Very compact stadium. Pumped for the trip in November to MetLife!